Ensuring your vertices are properly accounted for can reduce rendering errors, modeling troubles and ease the UV tweaking process. In certain instances you can reduce poly count without losing useful geometry. This Documentation is Maya specific, but all of this information can be interpreted to be used in other 3D applications. 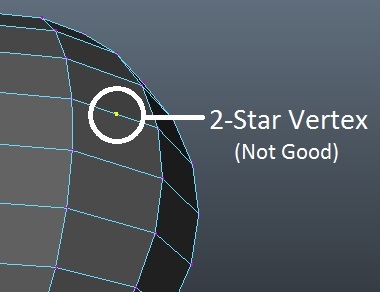 One of the main concerns with clean geometry is stray vertices, hereafter called 2-star vertices. 2-star vertices occur when geometry is not as carefully removed and edited on a mesh. For example a series of edges may be unnecessary or need reworking on a mesh. When a series of edges is selected and deleted the vertices associated with those edges remain on the mesh. These 2-star vertices can cause rendering errors because they create n-sided faces (faces with 5 or more edges). Rendering programs have to triangulate all geometry, so an n-sided face can cause an error due to this extra edge. Tip: One easy way to tell if you have any stray vertices. If you’re positive your model is all quads, there should be 2 more Verts than Faces. 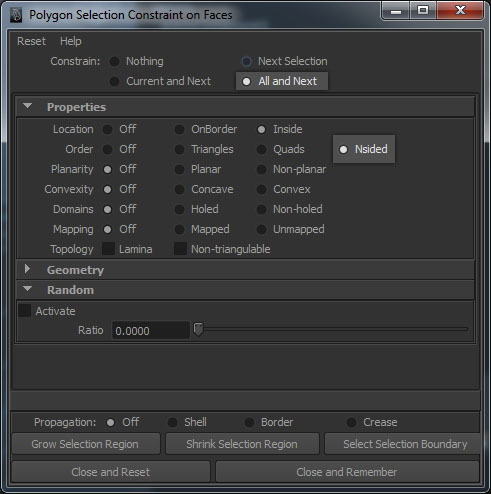 Use the Polygon Selection Constraint on Faces tool to isolate n-sided faces. These faces hold the 2-start verts that will need to be resolved. The different tools used to merge verts are found in Edit Mesh menu. 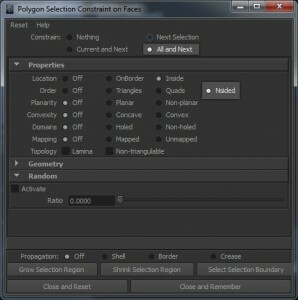 Merge tool: This tool is for merging vertices that are within a range specified in the tool menu. Merge to Center: Allows you to select multiple vertices, edges, or faces and merge them to the center point of the selected vertices. Collapse: Allows you to select vertices, edges, or faces and collapse them to their most local perimeter vertices. Merge Vertex Tool: Interactively select two verts to merge, release mouse button to complete action. Delete Edge/Vertex: When selecting an edge loop, or two or more consecutive edges, use this tool to delete the vertices associated with that edge series. Simply select the verts, if selecting multiple hold down Shift and hit Delete. 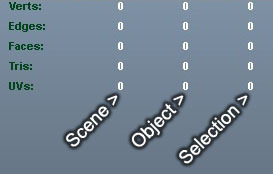 Note that only verts with two or less edges attached can be deleted. A set of vertices determine the boundaries of a UV set. A UV point exists only where a vertex exists. In other words, there can be no UVs on an edge, only a vertex.